Gah. Well I don’t know about you, but it feels like this is a time of chaos and uncertainty – where you’ve got to fight tooth and nail for the things that are important to you. 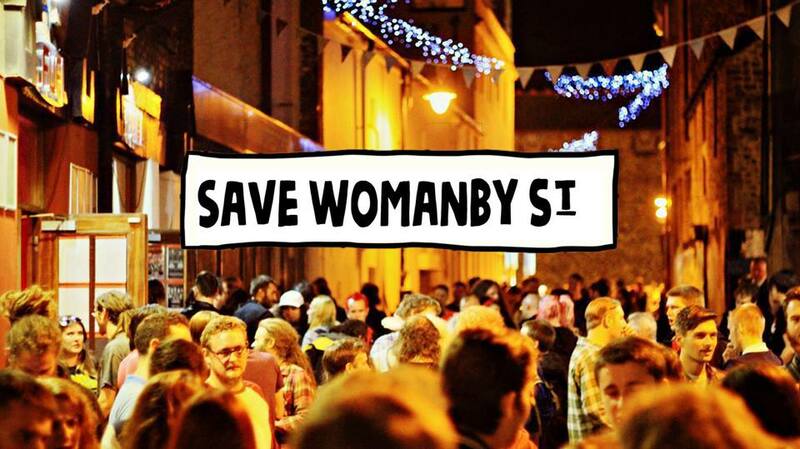 If you’ve ever been to a gig on / been drunk on / sat around at midnight on / enjoyed a festival on WOMANBY STREET, then you owe it to the alternative cultural scene of the city to JOIN THE CAMPAIGN TO SAVE IT! If you’re not into chain bars, Cardiff’s night time economy is a pretty small slice for you: don’t let them take it away from us. So what’s going on? In brief, a request for planning permission has gone in for residential to be built on Womanby Street. The Sprout have a pretty good precis of the situation, so rather than me rewording it, just go over there and read it: Save Womanby Street (The Sprout). You have until tomorrow to LODGE YOUR OWN OBJECTION to the planning application on Cardiff Council’s website. When you look at the overwhelming amount of negative feedback from residents, councillors and MPs, it’s almost inconceivable they’ll allow it to go ahead. But who knows what greases the wheels behind the closed doors of the Powers That Be, eh? You’ll need to register (it takes 30 seconds) before you can post a comment. PLEASE DO THIS. It’s a bit late now, but you can still write to your councillor / Assembly Member / Member of Parliament to complain about the way the law is applied with regards to responsibility of soundproofing between England and Wales. Millennium Walk graffiti wall is gone. The Full Moon was going … it’s been rebooted … but it’s important we try and support these local independent businesses, and celebrate the Cardiffians behind them. Good luck to everyone going on the march on Saturday. We’ll see you down the front.